Women and children among injured as Israel launches "Operation Protective Edge"
There were more than 50 airstrikes early today. ISRAELI WARPLANES POUNDED Gaza with more than 50 strikes early on Tuesday after Hamas militants fired scores of rockets over the border, dragging the two sides towards a major conflict. 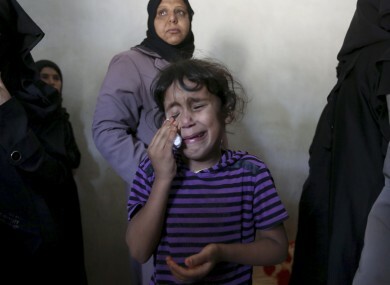 In Gaza, medics said seven children and two women were among 17 people wounded. Two were in serious condition, an emergency services spokesman said. The Israeli military confirmed it had embarked upon an air campaign dubbed “Operation Protective Edge” aimed at reducing rocket fire on southern Israel. So far, the rockets have caused only a handful of minor injuries on the Israeli side. Palestinian security sources put the number of air strikes at more than 70. Witnesses said several houses had been targeted, notably in the southern city of Khan Yunis. Israel’s Islamist foe Hamas warned that Israel had “crossed a red line” and would pay the price. “If this policy does not stop, we will respond by enlarging the radius of our targets to the point where the enemy will be surprised,” the group’s military wing, the Ezzedine al-Qassam Brigades, said in a statement. The army said 81 rockets had struck southern Israel on Monday, around a third of them during a short period in the evening with another six hitting the south early on Tuesday . Sirens sounded in 10 towns, including as far away as Beit Shemesh, 80 km from the Gaza Strip, an army statement said. Around 16 rockets struck around the southern city of Beersheva, 40 km from Gaza and home to 200,000 people. All summer schools and camps were cancelled within a 40 kilometre (25 mile) radius of Gaza, except those being held in protected spaces, Israeli army radio reported. At a Monday meeting, the security cabinet gave the army the green light for a “staged escalation” in which the pressure on Hamas would be stepped up with every passing day, the radio said. Finance Minister Yair Lapid said the aim was to return calm to the south. “First and foremost, the aim is to calm the south and allow citizens living there to get up in the morning and be able to send their kids to summer school,” he told the radio. “It is exacting a price that is unacceptable from citizens of the south, but our aim is to find the most effective way to return calm to the south,” he said. “We will do this with strength and power but part of having power means you act in the right way and not just according to the voices shouting from the crowd,” he added, alluding to calls from cabinet hardliners for a full-scale ground assault on Gaza. Israel’s Channel 1 television showed footage Monday of dozens of tanks massing near the Gaza border, preparing for a possible offensive against the enclave. “Hamas has crossed the red line, and unfortunately it will pay for it,” a senior official told the private Channel 10 television. He said Hamas had 100,000 rockets at its disposal, some of which could reach Israel’s largest city Tel Aviv. Early on Monday, Israeli air strikes killed three Palestinian militants, one from Hamas and two from a smaller faction. Another five Hamas militants died and one was critically wounded when a tunnel collapsed near Rafah, on the Egypt border, with the armed wing blaming it on an Israeli air strike. But the Israeli army denied hitting the area and a spokesman described it as a “work accident” by militants mishandling explosives. The latest flare-up came a day after Israel arrested six Jewish extremists in connection with the killing of the Palestinian teenager. Mohammed Abu Khder, 16, was kidnapped and burnt to death last Wednesday in a suspected revenge attack for last month’s abduction and murder of three Israeli youths in the occupied West Bank. Three of them have confessed, an official close to the investigation told AFP. The killing sparked five days of clashes in annexed east Jerusalem and Arab towns across Israel, with police making hundreds of arrests. Email “Women and children among injured as Israel launches "Operation Protective Edge"”. Feedback on “Women and children among injured as Israel launches "Operation Protective Edge"”.